Growing cultural and age diversity in the workforce. A technology skills gap among workers. Leaner maintenance teams required to do more and know more. 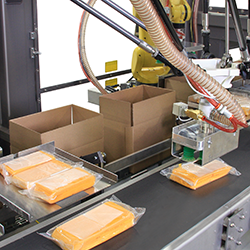 Increasing variation in products and package configurations to case pack, palletize, and stretch wrap. 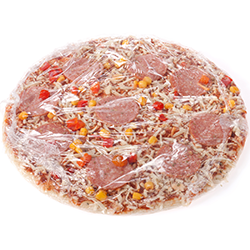 E-commerce companies requiring greater flexibility on the packaging line. Brick and mortar retailers demanding greater customization to differentiate themselves from their online cousins. Every customer asking for greater speed of fulfillment. The next stage in the evolution of stretch wrapping technology is in more intuitive human machine interaction. A human machine interface (HMI) strategy that enables a diverse, multi-language workforce to optimize stretch wrapping performance during every shift regardless of daily changing conditions. A remote monitoring capability that enables lean maintenance teams to keep the stretch wrappers running at peak efficiency while team members deal with a myriad of other responsibilities. 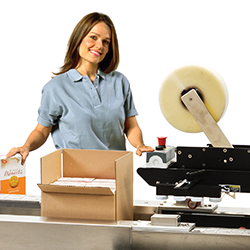 Stretch wrap machine and warehouse management system data integration that increases the distribution center’s responsiveness to retailers and other customers, streamlines operations, and optimizes cube utilization. A single scalable control platform across stretch wrap models that brings stretch wrap machines to market faster, simplifies training, and makes it possible for fast effective upgrades for every customer’s unique environment. 2)The features are incorporated cost effectively, bringing the benefits down to entry and mid-level machines as well as top-of-the-line solutions. Here are attributes to consider that make stretch wrap and other machines easier to use and maintain. When specifying a new automated stretch wrapping machine, look for a high definition touchscreen display that measures at least 5.5 inches (140 mm) at the low end and up to 7 inches (178 mm) at the high end. The larger and more defined the display, the more data that can be presented and the easier it is for the operator to see, understand, and manipulate icons and images. 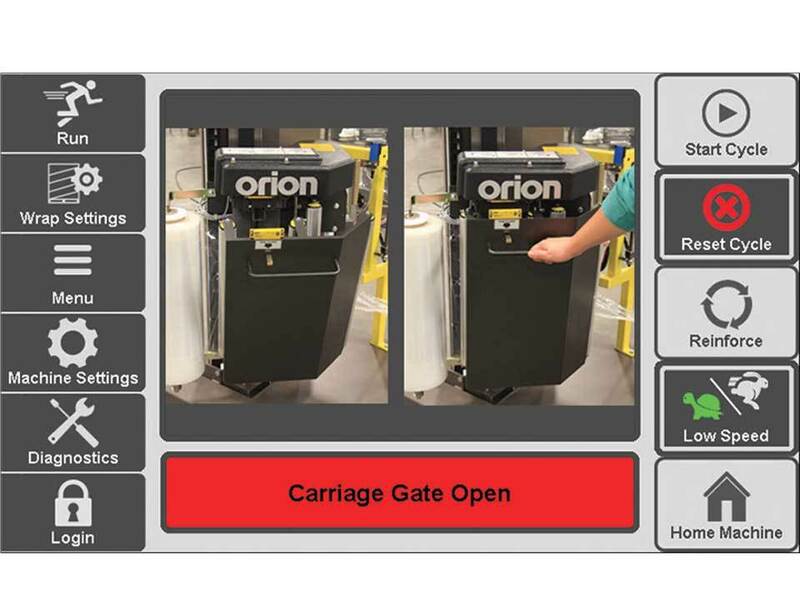 The color touchscreen display screen on a new Orion stretch wrapper utilizes all the available real estate to ensure maximum visibility of important data. The clean three knob arrangement is inviting, rather than cluttered and intimidating. Machines must use still images, video, and/or illustrations to show operators where on a machine a fault can be cleared and how to clear that fault. A machine fault prompts informative images to be shown on this Orion HMI. The photo on the left shows an open carriage gate, which prevents the stretch wrapper from running. The photo on the right shows the gate being pushed closed to clear the fault. The bold red fault bar will change to green when the fault is cleared. For the last several years, OEMs have been redesigning HMIs to be more icon based because today’s operators feel comfortable with smart phone and tablet navigation. The problem sometimes has been that the icons are designed by engineers and not user friendly. When evaluating a stretch wrapping machine, go ahead and start it up. Ask yourself, was the process intuitive? Were there issues trying to “back out” when navigating to a home screen? If so, that is a problem. Going to a function or backing out of one should be accomplished on average in two taps. An easy to use HMI gives workers more power to solve problems and keep the flow of wrapped pallets moving. It also builds operator confidence and improves morale. At the top left an icon of a person running represents “run,” and at the bottom right an icon of a house “homes the machine.” A tortoise and hare icon above the house represents “speed.” These icons transcend language. All machine settings, including lifecycle (cycle) counters and shift counters. With cycle count and number of loads, maintenance personnel know when to service the machine and purchasing personnel can order film on a just-in-time basis. The system diagnostics manager, also part of the dashboard, allows maintenance personnel access to troubleshooting tools down to I/O level devices. Only authorized personnel enabled by the end user’s IT departments may access this information. Remote monitoring provides secure 24/7 access to information and tools that help effectively allocate resources while maintaining maximum throughput. The Orion team specified industrial computer control for its new stretch wrappers. These computers excel at timely, seamless transfer of data to warehouse management systems. Realtime data enables greater organizational flexibility. 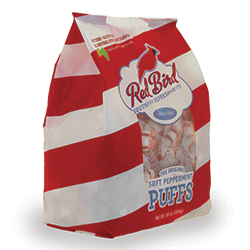 Information includes product location, pallet size, weight, and time of processing. Some end users might like to tie load dimensioning applications into the mix for insight into greater cube utilization. Time to market for delivery of new machines is faster when the control architecture is scalable. Customer tech support improves when the OEM and distributor’s support teams intimately know one control platform rather than many. Spare parts and inventory requirements decrease. Customers gain operational advantages when there is a similar look and feel between machines. System updates come more frequently and effectively when there is a unified platform. It is also easier and faster to have updates delivered via USB stick inserted into a port on an industrial computer versus dealing with specialized cables and software to update a PLC.